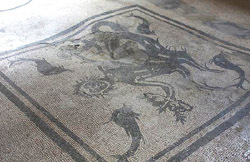 Full day guided excursion to the famous Archeological excavations of Pompeii and Herculaneum, destroyed in the A. D. 79 eruption of Mount Vesuvius. For more than 1600 years, they remained buried until Herculaneum was rediscovered in 1738 and Pompeii ten years later in 1748. Pompeii holds an intense fascination for visitors today. Following the eruption of the Volcano Vesuvius in the year 79 A.D., Pompei lay buried and forgotten for hundreds of years. The town is high on the list of Wonders of the World and the excavations begun in the 18th century are still being carried out today. Our guide will take you slowly some of the ancient streets of Pompeii where you can see Baths, the Forum and houses built the prosperous Romans. Among the structures uncovered was The Forum of Pompeii, a group of temples, courts, and palaces that served as the city's legislative center. Even if your interests do not lie in history, this is an archelogical site that you cannot be failed to be impressed by. 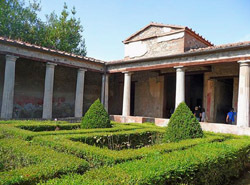 Herculaneum was a smaller town close to the city of Pompeii. Its main industry was fishing. 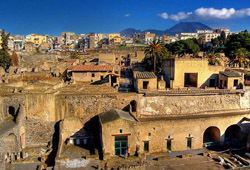 When Vesuvius erupted in August of 79 A.D., Herculaneum was buried under nearly 60 feet of superhot mud. When the mud cooled, it set nearly as hard as concrete. This makes excavations very difficult, but scientists continue their work to learn about the people and the town of Herculaneum. A large portion of treasures lie buried under the rock. THIS EXCURSION OF POMPEII & HERCULANEUM COSTS EURO 220. ENTRANCE FEES ARE NOT INCLUDED.